This box of 20 individual peel and stick luggage labels are suitable for scrapbooking, decoupage, gift wrapping and, of course the adornment of old trunks and luggage. 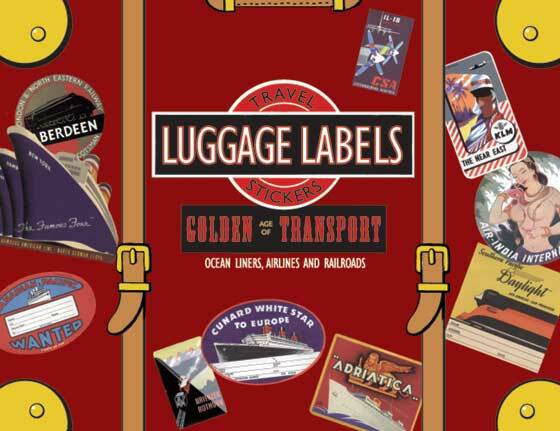 This selection celebrates transport by air, land and sea; some of the airline labels we include are: TWA, Trans Asiatic, Air India, TACA, and Czechoslovak Airlines. There are ocean liner labels from Matson, Cunard, N.Y.K. and Canadian Pacific. The railroad labels include the Northern Pacific line, The Orient Express, The Flying Scotsman and the Brienzer Rothorn. Only a vastly ambitious traveler could have achieved this selection on their own.